Ok so I've got so far but now up against a brick wall and need some guidance please. The answer may be hiding in earlier posts, but I can't find it, so please excuse me for possibly repeating someone's post. 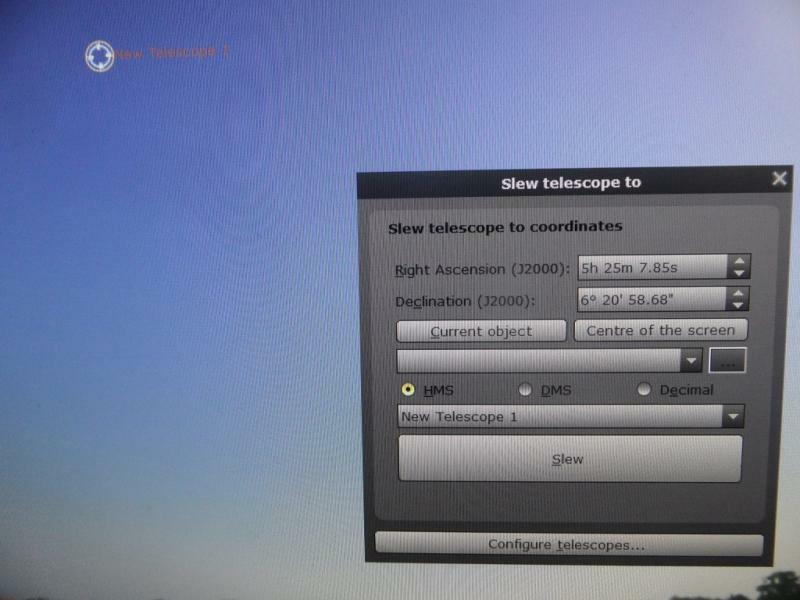 I've loaded Stellarium 0.19 - the latest version, and also Stellarium Scope on my PC. I've connected my Meade LX200 10" (G Dudash upgrade version) Autostar handset to the PC via a 20m cable with serial to USB adapter. I've followed as far as I can the instructions on the Stellarium Scope guide, and thought I was on a winner when I got my Mrs Meade to move across the screen to a chosen star on Stellarium. I double checked outside and was pleased to see the telescope had slewed properly. You can see (maybe) on the pic that the telescope circle is annular with the object I have chosen (Bellatrix). Now my pic was taken during the day, but I also had the same "success" last night. But when I checked through the eyepiece I wasn't on the star and needed to carry out an adjustment to find it and centralise. Now I understand that there is a sync function on Stellarium Scope which I presume can enable precise centering, but I can't get this to respond and the message comes up that Stellarium Scope only functions well with Stellarium version 15.1 or earlier. I found and downloaded a Stellarium Portable version 0.15 but this failed to even show my telescope. So I either need to find an original version 0.15 to download, or preferably, find a way to sync when using version 0.19. So near yet so far...……….